This definitive sourcebook for the Pathfinder Roleplaying Game provides tons of new character options for all seven "core" player character races, from archetypes that allow elf characters to explore their connection to nature and magic to feats and spells that let a dwarf character carry on the legacy of his multi-generational clan or a gnome explore her connection to the First World or delve deep into her weird obsessions. Additionally, the Advanced Race Guide offers meaty sections on a dozen "spotlight" races that make interesting and exciting player character options, such as goblins, aasimar, tieflings, dhampyrs, drow, the elemental races from Bestiary 2, and several others. All PC-appropriate monster races in the Pathfinder Roleplaying Game, including creatures from all three Bestiaries and The Inner Sea World Guide, receive race options equivalent to those presented for the core races in the Core Rulebook, for the first time allowing players to create and play characters like merfolk, grippli, duergar, stryx, and every other appropriate monster currently in the Pathfinder game. Lastly, the Advanced Race Guide includes an extensive section that allows players and GMs to build their own custom races, either to emulate more powerful creatures that already exist in the game or to create wholly original characters unique to their campaign. 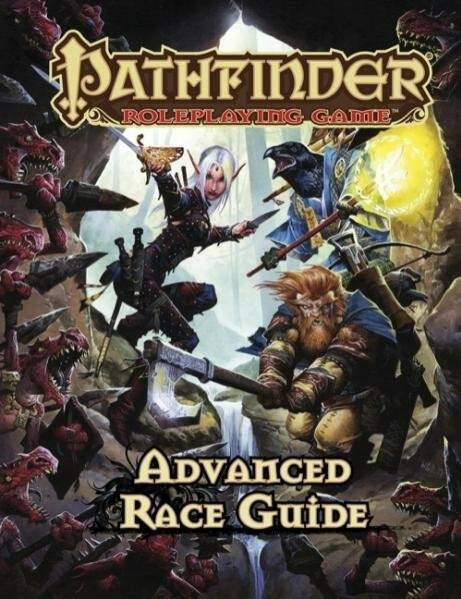 - The Advanced Race Guide is a major Pathfinder RPG release for 2012, with major marketing, advertising, and Pathfinder Society Organized Play support throughout the calendar year. - The Pathfinder RPG is now tied for first place as the best-selling tabletop RPG on the market. More than 100,000 gamers play in active Pathfinder RPG campaigns. Pathfinder's monthly Adventure Path product enjoys more than 10,000 readers, making it the best-selling monthly print RPG product on the market. - Extensive promotion in game industry trade publications and through online marketing initiatives targeting Paizo's 200,000+ community of gamers. - A beautiful cover by fan-favorite artist Wayne Reynolds is sure to attract attention to this high-profile release.